To see the sights of Utah I had planned out a clockwise loop. Coming up from Page Arizona on Highway 89 I passed through Kanab and continued north. From my base at Bauer’s in Glendale about 30 miles north of Kanab, I visited Zion and Bryce. 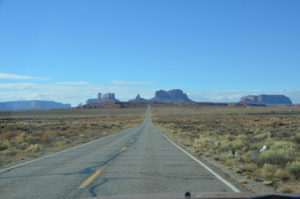 From here I traveled across scenic highway 12 and 24 to Capitol Reef. I’d highly recommend the unintended side trip to Colorado National Monument, but maybe not the Turkey Pot Pie. 🙂 Back from the side trip I headed down the east side of Utah along highway 191. 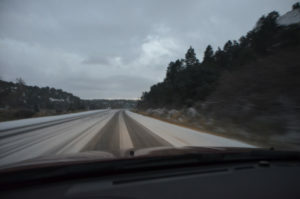 After a great day at Arches, I ran into some snow. 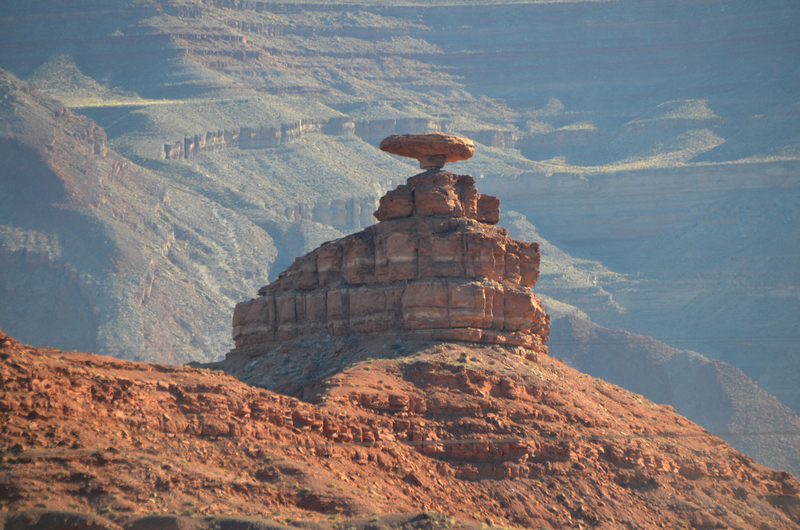 But by the time the day had ended I was back at a more temperate altitude in Bluff, UT. From Bluff I followed 191 west until it joins up with highway 163. A pleasant wide open road, the morning cool was just waning. 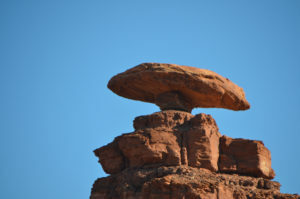 I had been talking with a friend who had been along this way and he suggested I be on the lookout for a rock formation that looks like an upside down sombrero, or “Mexican Hat” as it is named. The turn off was only a short half hour down the road. The rock formation is just visible from the road on the left, but there is a pretty good gravel road leading down closer alongside it. The intersection has a wide area on the right where you can pull off if you don’t feel like driving down the gravel. 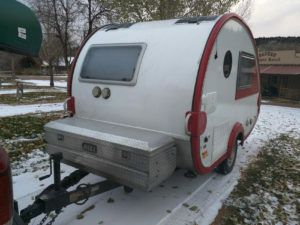 I found plenty of opportunities to turn my little trailer around. I stayed on the wider road that passes to the west of the rock, got a couple of pictures, turned around and was on my way in maybe 15 minutes. The rock formation is definitely impressive. The “brim” of the hat is large in comparison to the “center” of the hat making it look wobbly on its own. But then the top of the hat is resting on a thing layer of crumbly looking lighter colored rock. It certainly makes you wonder just how long it will stay perched there as it is. Nearby you can see similar rocks whose underpinnings have eroded away. Worth a quick stop, or maybe a little longer. The narrower road would offer a different perspective, and it appears to offer an overlook of the San Juan River too. As I traveled further, I started to see steep sided rock towers on the horizon. I could feel that I was getting close to a photo opportunity. As I rounded the corner there were people out of their cars wandering around, everyone with a camera in hand. I slowed as there were several folks in the middle of the road, one kneeling down on the centerline. The people engaging in the most dangerous behavior looked to be young folks in their early 20’s, in groups of four or five, typically having emerged from what was clearly a rental sedan with all four doors left open, parked a bit too close to the road. Most commonly Asian or East Indian I was guessing they were on a grand tour, but maybe a bit more abbreviated than mine. The scurrying and selfie snapping, and group selfie snapping and all pretty much meant I had to come to a stop. Happily I had been slowing to figure on taking my own photo and I had been looking behind and saw there wasn’t a car for at least a mile behind. So I prepared my camera, slowed to a crawl to let the activity work its way back to the shoulders and then took up station in the prime photo spot, took a couple through the windshield and then roared off down the road. 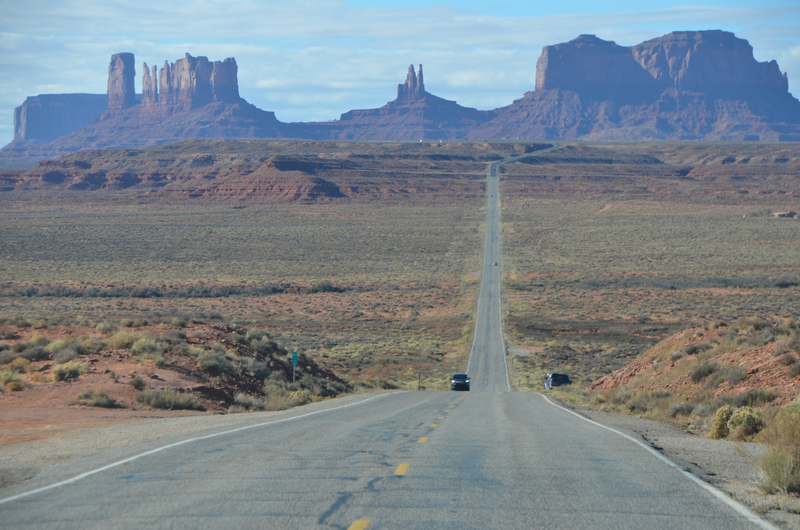 I had considered taking the side trip to the Navajo’s Monument Valley Visitor center, but I hadn’t done a lot of research on where it was or what to expect there, so I traveled on. If I am back this way again I will be doing a bit more research on the Scenic Drive mentioned on this page. On the far side of the area I pulled over to see about taking a photo from the opposite side. Here the place I pulled over had an Navajo lady selling very nice art. I looked and admired and she softly tried to offer reasons I needed to take some home. But alas I have too much stuff as it is. Photo taken, a smile and my polite apologies for not purchasing, a mention of my trip and this blog, and I was away. 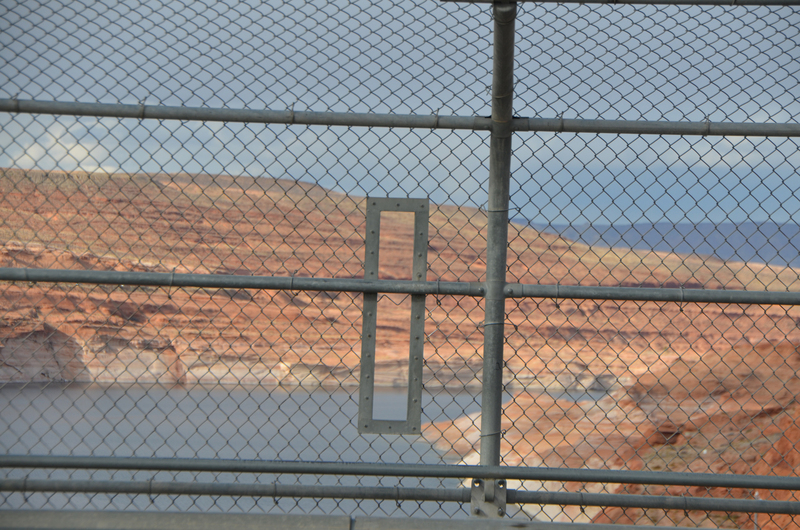 Next notable stop was at Glen Canyon Dam. I pulled over and walked out onto the bridge. I’ve certainly seen plenty of dams, and this one wasn’t so interesting, but I did find something they had done to the fence very much worth noting. They had cut a vertical patch out of the fence and lined the edges with a metal rectangle. These were provided at intervals on both sides of the road. They appear to be for folks like me looking to take a photo through the fence. Very handy they turned out to be. I think this is an idea that needs some promoting! So, on my way again I had decided to land at a known location, Bauer’s Canyon. But tonight’s experience ended up being a little different. 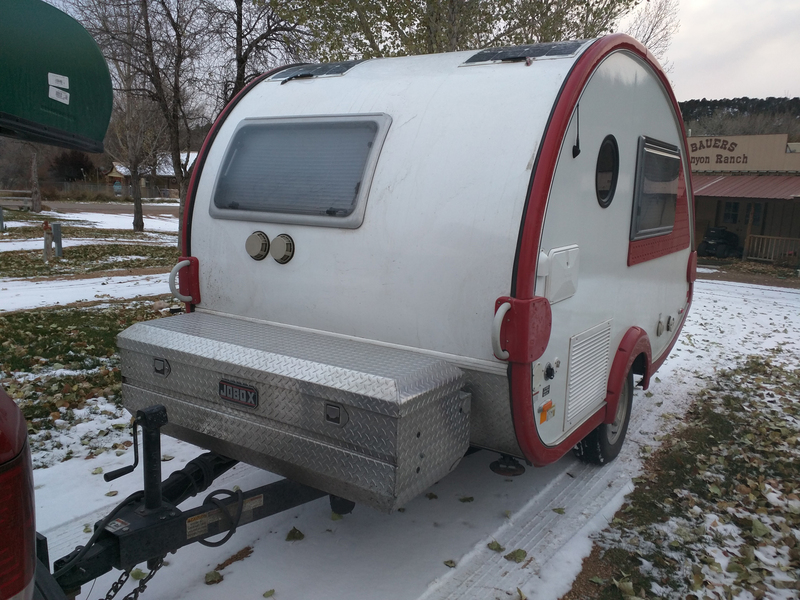 The temperature dropped well below freezing, according to weather reports it got down to about 10 degrees F. The heater had some trouble keeping up, and to make things worse the fan on the 12v converter wouldn’t stop running. I packed a blanket around it so it wouldn’t blow cold air on my feet. I think it was trying to keep up with the 12v draw for lights and the TV which I was using to watch a video. I was plugged into shore power, but the heater wasn’t keeping up. I wish I had known that I could turn on the propane AND the electric at the same time for the heater I think that might have tipped the balance. In any case I tried to run some water through the lines from time to time to keep them from freezing, but eventually the water stopped flowing. Next morning on my travels I stopped a couple of times to see if things had thawed. It was about two hours back in the warm lower elevations before water was being pumped again. That day I stopped at a hardware store and picked up a small portable electric heater which I think I’ll keep handy in the future. 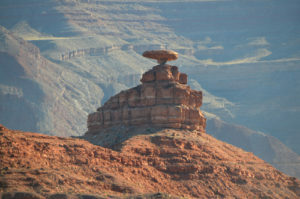 Mexican Hat Rock from a little distance with the canyon wall of the San Juan River in the background. Was this once a smaller hat? 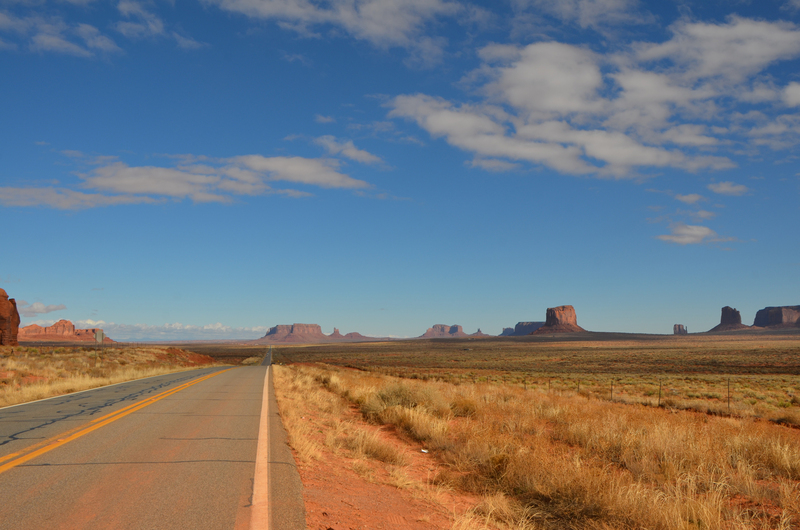 Monument Valley – if you could see to each side there are people milling about everywhere. I gather than somewhere in this stretch of road was used in filming the movie Forest Gump. In any case this is a pretty popular view. One of the Monuments, glowing in the winter sun. The highway bridge at Glenn Canyon Dam. 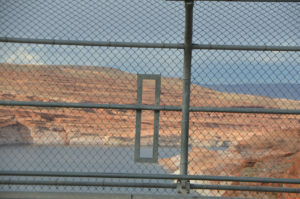 But this neat “fence window” was provided apparently for us photographers. No more snow tonight, but well below freezing.